If prose had a one-night stand with poetry, The Glitch Factory would be their forbidden love child. The blend of poetic rhythm and common cadences with Thompson’s iStyle brings forward an unusual narrative perspective to plugged-in readers. Individually, each short or flash offering of fiction maintains a distinctive voice. The repeated series of adverbs, use of high-vocabulary, and observational story telling read like a favourite blog or diary written by your bestie from university, and Thompson’s poetry crystallizes these thoughts and feelings. This omniscient near-stream-of-consciousness writing carries with it the feel of IM-ing, texting, and internal monologue that changes little from one point of view to the next. It acts as a binding thread between each of the stories which have a natural connectedness with her poetry and the theme of human nature. An extreme intrapersonal focus is carried throughout this work with Thompson’s inclusion of digital photos intended to enhance and compliment reading. The images chosen are reminiscent of camera cell phones and selfies meant for social media sharing with varying quality in picture, focus, and pixilation – personal to the photographer and a like-minded entourage. With a style this particular and exacting, so must be Thompson’s target reader: I envision highly educated 20 & 30-somethings from the cusp of the first-wave of social media babies who live and breathe constant interaction in the absence (and sometimes company of) other individuals – the coffee-shop-aholic. Thompson has tapped into their language, lingo, and lyricism in a way no other writer has. However, with such a tight audience scope, Thompson needs to balance which writing rules to break and which ones to enhance – a task not always performed to capacity. With a penchant for metaphor over realism, her stories keep readers at arm’s-length as she allows the narration to skim emotional connection and deeper personal attachment. That being said, if a reader is commuting via the train or bus and requires mental stimulation during travel, the vignettes Thompson offers with both her prose and poetry are sufficiently satisfying for a quick indulgence. The scales tip once again with the imagery included in this anthology. Several chosen pictures are difficult to link to the content they are included with, and jar reading continuity with the imbalance of time and place. This experience is echoed with Thompson’s occasional narrational reference to herself/himself as a writer. This choice of approach, relevant to the idea of personal blogging, does not yet transcend into this new iStyle she has created. 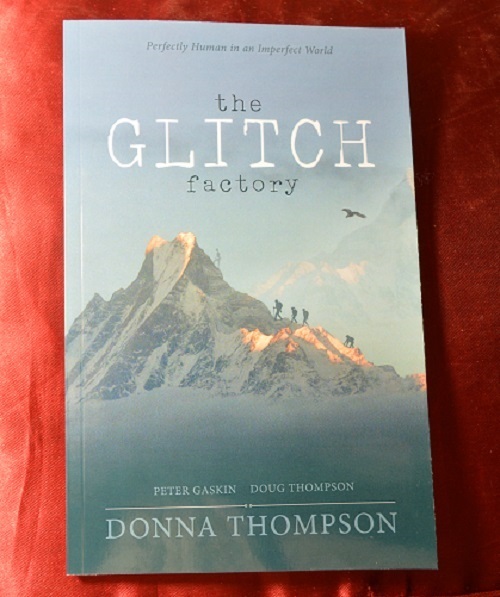 The Glitch Factory is a glimpse at human nature with all the imperfections this race of beings can offer, inclusive.